Öğrenme, doğumdan itibaren bireyin yaşamında önemli bir rol oynamaktadır. Etkili öğrenmenin gerçekleşebilmesi bireyin zihinsel, duygusal, sosyal ve fiziksel gelişimine bağlıdır. Bütün bu alanlardaki gelişim beynin işlevsel çalışmasına bağlı olarak gerçekleşmektedir. Gelişen teknolojinin de etkisiyle son yıllarda beynin öğrenme üzerindeki etkisini inceleyen çalışmaların sayısı artmıştır. Bu doğrultuda öğretmenlerin çalışma sonuçlarını öğretim ortamına aktarma çabaları gözlenmektedir. Bilimsel çalışmaların öğretim ortamına aktarımında araştırmacıların ve uygulayıcıların etik sorumlulukları bulunmaktadır. Beyin ve öğrenme arasındaki ilişkiyi açıklamaya yönelik yapılan çalışmalardan elde edilen kanıtların doğru yorumlanması ve aktarılması önemlidir. Bu çalışmada, alanyazında beyin ve öğrenme arasındaki ilişkiyi açıklayan, buna ilişkin kanıtlar sunan çalışmalar incelenmiş ve derlenmiştir. Alanyazından elde edilen bilgilere dayalı olarak uygulamaya yönelik öneriler geliştirilmiştir. Learning has taken important part for people’s life, since born. Effective learning depends on individuals’ mental, emotional, social and physical development. Development of all these areas bound up functional working of brain. Recently, examining brain effect on learning researches are increased with developing technology. Accordingly, teachers try to transfer these research results into learning environment. Transfering scientific researches into learning environment involves ethical responsibility for researchers and implementers. Correctly interpreting and transfering the research evidences which explain the relationship between brain and learning are important. In this article, the researches that explain relationship between brain and learning in literature are analyzed and compiled. With these information (based on literature) reccomendations have been developed for implementation. Anderson, O. R. (2011). Brain, mind, and the organization of knowledge for effective recall and application. Learning Landscapes, 5 (1), 45-61. Ansari, D. Coch, D. & De Smedt, B. (2011). Connecting education and cognitive neuroscience: where will the journey take us? Educational Philosophy and Theory,43(1), 37-42. Borst, J. P., Taatgen, N., A., Stocco, A. & Van Rijn, H. (2010). The neural correlates 0f problem states: testing fmrı predictions of a computational model of multitasking. Plos One, 5 (9), 1-17. Caine, R.N. & Caine, G. (1991). Making connections making and the human brain. Virginia: Association for Supervision and Curriculum Development. Connell, J. D. (2009). The global aspects of brain-based learning. Educational Horizons, 88(1), 28-39. Delong, G. R. (1993). Effects of nutrition on brain development in humans. The American journal of clinical nutrition, 57, 286-290. Dembo, M. H. (1994). Applying educational psychology. New York: Longman. Ebrahim, H., Seleti, J. & Dawes A. (2013). Learning begins at birth: ımproving access to early learning. Berry, L., Biersteker, L., Dawes, A., Lake, L. & Smith, C. (ed). South African Child Gauge 2013. Cape Town: Childrens’s Institute, University of Cape Town. Emmerson, J. (2011). Your mind on music: muffins, magic, mozart, myth. Learning Landscapes, 5 (1), 63-70. Erickson, K. I., Voss, M. W., Prakash, R. S., Basak, C. & Szabo, A.(2011). Exercise training increases size of hippocampus and improves memory. PNAS, 108 (7), 3017-3022. Feinstein, S. (2011). The Teenage brain and technology. Learning Landscapes, 5 (1), 71-84. Ferrari, M. & McBride, H. (2011). Mind, brain and education: the birth of a new science. Learning landscapes, 5 (1), 85-100. Fidan, N. (1986). Okulda öğrenme ve öğretme. Ankara: Kadıoğlu Matbaası. Fischbach, G. D. (1992). Mind and brain. Scientific American, 267 (3), 48-57. Giganti, F., Arzilli, C., Conte, F., Toselli, M., Viggiano, M. P. & Ficca, G. (2014). The effect of a daytime nap on priming and recognition tasks in preschool children. Sleep. 2014 Jun 1, 37(6):1087-93. Guesry, P. (1998). The role of nutrition in brain development. Preventive medicine, 27, 189-194. Hebb, D. O. (1972). A textbook of psychology. Philadelphia: Saunders. Herdman, E. A. (2006). Derleme makale yazımında, konferans ve bildiri sunumu hazırlamada pratik bilgiler. 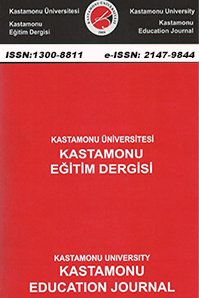 Hemşirelikte Eğitim ve Araştırma Dergisi, 3 (1), 2-4. Immordino-Yang, M. H. & Damasio, A. (2011). We feel, therefore we learn: the relevance of affective and social neuroscience to education. Learning Landscapes, 5 (1), 115-130. Jensen, E. P. (2008). A fresh look at brain-based education. Phi Delta Kappan, 89, 408–417. Joja, D. O. (2013). Learning experience and neuroplasticity-a shifting paradigm. Noema, XII, 159-170. Kirschbaum, C., Wolf, O. T., May, M., Wippich, W. & Hellhammer, D. H. (1996). Stress-and treatment-induced elevations of cortisol levels associated with ımpaired declarative memory in healthy adults. Life Sciences, 58 (17), 1475-1483. Leproult, R., Copinschi, G., Buxton, O. & Cauter, E. V. (1997). Sleep loss results in an elevation of cortisol levels the next evening. Sleep, 20(10), 865-870. Lipsett, A. B. (2011). Supporting emotional regulation in elementary school: brain-based strategies and classroom ınterventions to promote self-regulation. Learning Landscapes, 5 (1), 157-175. Logan, G. D. & Burkell, J. (1986). Dependence and independence in responding to double stimulation: a comparison of stop, change, and dual-task paradigms. Journal of Experimental Psychology: Human Perception and Performance, 12 (4), 549-563. Lupien, S. J., Leon, M., Santi, S., Convit, A. & Tarshish, C. (1998). Cortisol levels during human aging predict hippocampal atrophy and memory deficits. Nature Neuroscience, 1(1), 69-73. Macklem, G. L. (2008). Practitioner’s guide to emotion regulation in school-aged children. New York: Springer. Medina, J. (2009). Brain rules. Seattle: Pear Press. Miller, G. A. (1956). The magical number seven, plus or minus two: some limits on our capacity for processing information. The Pyschological Review, 63 (2), 81-97. Ortiz, T. (2010). Anatomical evidence for cerebellar and reticular activating system involvement in adults with attention-deficit/hyperactivity disorder. Yayımlanmamış doktora tezi. Alliant International University, Los Angeles. Peterson, L. R. & Peterson, M. J. (1959). Short term retention of individual verbal items. Journal Of Experimental Psychology, 58, 193-198. Sattelmair, J. & Ratey, J. (2009). Physically active play and cognition an academic matter? American Journal of Play. Winter, 365-374. Senemoğlu, N. (2013). Gelişim, öğrenme ve öğretim. Ankara: Yargı Yayınevi. Slavin, R., E. (2006). Educational pyschology theory and practice. Boston: Allyn&Bacon. Sousa, D. A. (2011). Mind, brain and education: Theiımpact of educational neuroscience on the science of teaching. Learning Landscapes, 5 (1), 37-43. Tali, S., Delgado, M. R. & Phelps, E. A. (2004). How emotion enhances the feeling of remembering. Nature Neuroscience, 7 (12), 1376-1380. Tavernijers, J., Ruysseveldt, J. V., Smeets, T. & Grumbkow, J. V. (2010). High-intensity stress elicits robust cortisol increases, and impairs working memory and visuo-spatial declarative memory in special forces candidates: a field experiment. Stress, 13(4), 323-333. Uauy, R. & Dangour, A. D. (2006). Nutrition in brain development and aging: role of essential fatty acids. Nutrition Reviews, 64 (2), 24-33. Uncu, Y. ve Akman, M. (2004). Sağlığa biyopsikososyal yaklaşım, aile doktorları için kurs notları. Ankara: Ata Ofset Tanıtım ve Matbaacılık. Willis, J. (2008). How your child learns best: brain-friendly strategies you can use to ignite your child’s learning and ıncrease school success. Naperville, IL: Sourcebooks. Zull, J. E. (2011). From brain to mind using neuroscience to guide change in education. Sterling VA: Stylus Publishing. ISNAD AŞKIN TEKKOL, İlkay , BAŞAR, Tarık , ŞEN, Zeynep , TURAN, Sevgi . "Öğrenmede İnsanı Odağa Almak: Beyin Araştırmaları Doğrultusunda Bir Tartışma". Kastamonu Eğitim Dergisi 25 / 3 (May 2017): 1187-1202.